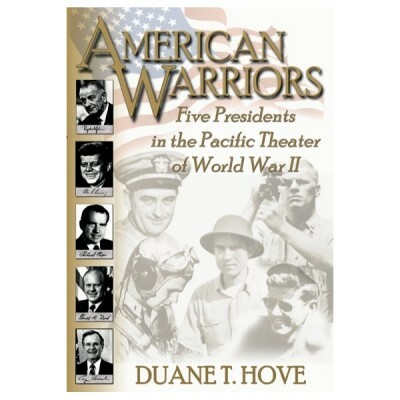 Five United States presidents served their country as Naval Reserve officers in the Pacific Theater of World War II. Presidential biographies gloss over this important period of their lives and are often inaccurate. American Warriors reconstructs the presidents' wartime roles based on interviews with more than one hundred veterans and on primary sources such as action reports, ships' logs, war diaries, and letters. Lyndon B. Johnson and John F. Kennedy were commissioned officers before the Japanese attack on Pearl Harbor. Richard M. Nixon and Gerald R. Ford sought and received officer’s commissions in 1942. George H. W. Bush entered the Naval Reserve as a seaman, second class, after graduating from high school in 1942 and was commissioned in June 1943 during flight training. During the war, Johnson conducted an inspection tour of MacArthur’s newly formed Southwest Pacific command and embarked as an observer on a bombing mission over New Guinea. Kennedy skippered two PT boats in the Solomon Islands, one of which was lost in a collision with a Japanese destroyer. Nixon commanded ground aviation support units in the Solomon Islands. Ford, officer of the deck of the light aircraft carrier USS Monterey, survived an encounter with a deadly typhoon. Bush, flying off the light aircraft carrier USS San Jacinto, parachuted to safety and was rescued at sea when his TBM Avenger fighter-bomber was shot down over Chichi Jima in the Bonin Islands. Duane Hove’s five years of research and interviews shed new light on this period of our leaders’ history. His accounts provide detailed descriptions, void of folklore, of the presidents’ wartime military service.